The Head of Religion and Ethics in the BBC, Aaqil Ahmed, recently posted this blog on why he made the decision to hold ‘Songs of Praise’ from a small community built church in the ‘Jungle’, a piece of land where refugees desperately try and maintain a meagre pitiful existence in Calais. Aaqil Ahmed provides some reflective thoughts in his blog about Christian traditional beliefs which reflect on the poor and the dispossessed and this was one of the reasons why he discussed holding a session for Songs of Praise with the team. Yet, a decision made on the basis of highlighting and discuss dispossession, ethics, religious values and the celebration of faith, has led to far right groups like Britain First attracting the following comments, (below), on their Facebook page, targeting the faith of Aaqil Ahmed himself. The shocking comments underline the hatred that this group attracts and once again, we urge members of the public to contact Facebook and report in comments that promote bigotry and prejudice. Some information on reporting in comments can be found here. Key themes always come up in far right web-sites and through such bigoted posts. Here, the faith and identity of Aaqil Ahmed is mentioned, where bigots assume that being Muslim means being impartial. They also perversely, trot out the ‘Muslims are paedophiles’, line that has been promoted by far right groups after Rotherham and we have written about this before. Assumptions made that ‘Muslims will take over’ are also reminiscent of the kinds of anti-Semitic tropes that were used against Jews in Germany and within the UK in the 19th and 20th centuries and were a way of trying to keep Jewish communities away from the employment market, leading to many setting up businesses to work and support Jewish communities. The impacts of such discrimination affected Jewish communities for millennia in Europe and were a disgrace. Today discrimination, has sadly, found a voice through the targeting of Muslims, resurgent anti-Semitism, and hate targeted towards refugees and migrant communities, including the Roma in Europe. For the last 3 years, TELL MAMA has built up evidence on the language of anti-Muslim hatred. Key terms and words that are used and targeted towards Muslims have been collated through our work and we have worked with partner agencies to explain the meanings of the terms, their links to Muslim communities and the impacts on victims. One of the agencies that we have engaged with and worked with, has been the Crown Prosecution Service, (CPS). The CPS has regularly met with groups working as national hate crime reporting centres and has been receptive to advice from agencies on the changing nature of language targeted at communities because of their religion or faith. TELL MAMA has had sight of the draft ‘checklist for advice and charging lawyers‘ and we wholeheartedly support the excellent work of the CPS. Language and terms that have been used to target Muslims are included in the section on anti-Muslim or Islamophobic hate crimes and we believe that this a major step forward. Whilst we cannot and will not highlight key-words that are included in the advice sheet for charging lawyers, we believe that the document captures key words and will ensure that prosecutors are best advised on charging perpetrators who have targeted people because of their faith and when using specific terms. Al-Qaeda’s Ayman Al-Zawahiri has pledged allegiance to the new head of the Afghan Taliban in an audio on-line message. The move is seen politically to enhance the status of the new leader, (Mullah Mohammad Akhtar Mansour), after the death of the Group’s founder, Mullah Mohammad Omar, some two years ago. The move is seen as a way of shoring up the waning support for Al-Qaeda, a group which has largely lost traction and support to groups such as ISIS and local splinter extremist groups in countries across the Maghreb to the Middle East. The move is also meant to try and hold the group together as it started to splinter after the reported death of Mullah Omar. News reports have highlighted the fact that the so-called Islamic State has released 22 elderly Assyrian Christians that it had kidnapped from villages in the North-East of Syria. The captives were taken earlier in 2015 , though according to the UK based Syrian Observatory for Human Rights, estimates put the remaining group at about 150 people. The captives were taken when Islamic State fighters captured over a dozen villages in the Hasaka region. Christian communities have resided in this area for over a millennia and many of the residents are of Kurdish heritage. There are differing views as to whether a ransom had been paid for the release of the 22 individuals and this release follows a further release of captives that took place in March 2015. The post Islamic State Releases 22 Assyrian Christian Captives appeared first on Religious Reader. As we approach World Humanitarian Day (Aug 19), we should take time to reflect on the global human efforts to create the conditions for peace and prosperity amongst all mankind, and to stand in solidarity with people wanting to bring about progressive social change in their communities. As society comes together with the assistance of new forms of connectivity and transportation, we are transforming into an increasingly inclusive, interdependent and co-operative global community. It is in our nature to feel a sense of community with those we share resources, time and environment with. However, achieving such conditions is not without its challenges – discrimination, inequality, poverty, a worsening in national security conditions and the disregard of human life, all of which are still prevalent. Now, more than ever, it is imperative that we do not turn our backs on progressive causes and that humanitarians take the lead on sharing the global dimension to all these common challenges. It these themes that World Humanitarian Day was made to celebrate. Designated on the anniversary of the bombing of the United Nations (UN) Headquarters in Baghdad, Iraq, which killed 22 UN staff members, World Humanitarian Day is an opportunity when all peoples can celebrate the effort to improve human life and bring justice to every corner of the world. We should recognise that not all people have the benefit of economic security, life opportunities and freedom. In many parts of the world there are people just like us who are forced to live a life of fear and violence from oppressive regimes, economic exploitation by multinational corporations, and under the gaze of suspicion by wider society. From the ‘third-world’ countries where civil war, poverty and political instability plague the region to the ‘first-world’ countries where many have been left out of the wealth of their nation, far too many still see the struggles and battles that many in power and with influence believe have been won. Yet, even amidst these barriers there is undeniably an ideal among forward-thinking, progressive-minded people, which rejects these conditions and believes bringing about social change. This universal spirit in a better life for all people is what fuels worldwide efforts for a better human condition. There is no simple answer or method to bringing about an equal and more just world. But with the collective efforts by activists and charities, and aided by diplomatic negotiations, we are slowly but surely, working towards a brighter future for mankind. From efforts to support emerging democracy to international initiatives for the poor and marginalised in the world, it is clear that there is a force in our collective conscientiousness looking in the right direction and working towards it. So let us remember these aspirations for our planet and ourselves on August 19. Let us use World Humantiarian Day to remember those figures throughout history who have worked towards the betterment of mankind. Let us use this day to remember those who have fallen victim to a broken world. And let us use this day to remember the people who are working today to solve the global issues our species faces. For peace and prosperity for all, we will continue to fight. Varinder Singh Bola is a moderate British Labour Party politician who has served as a Councillor in the London Borough of Redbridge since 2014. He is a senior aide to a Labour Member of Parliament and is a parliamentary officer for a transatlantic nuclear weapons policy think-tank based in Whitehall, London. Varinder is related through his maternal family to the famous Indian freedom fighter and Ghadarite, Munsha Singh Dukhi of Jandiala (1890-1971). Varinder writes in a personal capacity. Nicholas Goodwin, 23, sent a Jewish mother a photo of himself with a Hitler Youth flag, after she stopped him from contacting her son. The photo depicts Goodwin and Callum Cochrane smiling as they posed with the flag. Elissa Wilson, their target, received the vile image via Facebook on January 29 – two days after Holocaust Memorial Day. Goodwin, admitted the charge of racially aggravated harassment, and received a six-month prison sentence. Cochrane escaped sentencing because he did not send or create the image. That sentence adds to an increasing list of crimes committed by Goodwin. Last month, he appeared in court after threatening to stab a 16-year-old, Goodwin and another person, hurled racist abuse at the victim. The judge noted that Goodwin was currently serving three concurrent prison terms at Low Moss Prison. But the problem of antisemitism in Scotland is not limited to online racists. 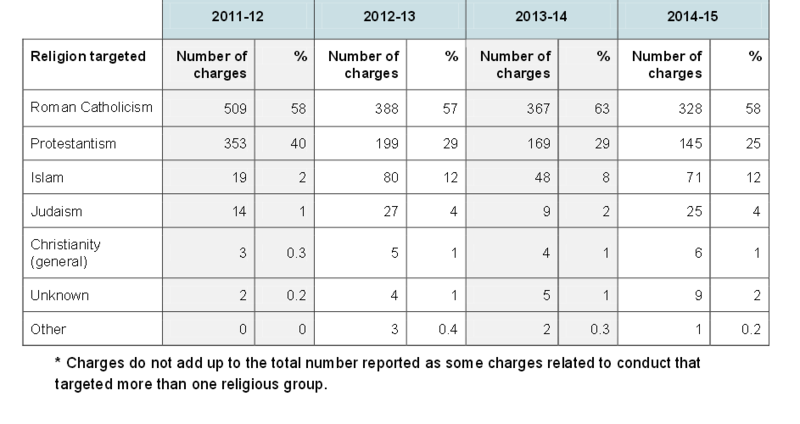 A breakdown of religious hate charges (with caveat). Credit: The Scottish Government. In spite of falling hate crimes in Scotland, the Scottish Council of Jewish Communities noted that 4 per cent of religious hate crimes are antisemitic in nature. That number seems small; but Scotland’s Jewish population totals just 0.1 per cent (or 6,000). Figures reveal that charges of antisemitism increased from 12 in 2013/2014 to 25 in 2014/2015 (an increase of 108%). That figure mirrors the 27 charges in 2012/2013. But as the Community Security Trust noted, this rise may reflect an increased confidence in reporting hate crimes. Islamophobic hate charges also increased by 47.9 per (a jump from 48 to 71 charges). Muslim communities in Scotland total just 1.4 per cent of the population. Yet, the number of Islamophobic charges falls just short of the 80 recorded in 2012/2013. This is an example of why work is needed with young people and we have raised this issue a number of times previously. The key is to ensure that young people understand that anti-Muslim hatred is just the same as other forms of prejudice, hate and intolerance and needs to be tackled. This is the experience of a young Muslim female who reported into us today. Khadija (whose name has been changed), was in a play park in Bournemouth on the 6th of August and she was playing with her siblings. She wears the Hijab. A group of young people in the park saw her and started to wave and laugh at her and they were no more than 13-15 years of age, in her opinion. After about half an hour, they approached Khadija and started to ask her a range of questions in a sarcastic manner. One of the girls stated, “I love your head-dress, where can you get it from, I want one,” as other laughed in the background. It was at this point that the young girl sitting next to Khadija grabbed her Hijab and pulled it off. She ran off with the Hijab and with the group laughing as they did so. Khadija has reported in the incident and to the young person who pulled Khadija’s Hijab, what you committed was a crime. If anyone saw the incident, can you contact the police on 101 and ask for Dorset Police. The information will be matched up since the victim has reported this in and the information would have been crime referenced. Information on this can also be sent to us. Finally, it is clear that a lot of work has to be done in educating and informing young people about anti-Muslim hatred. We will continue to raise this issue with the Department for Education. Oxford University digitised more than one hundred 19th Century Kalighat paintings depicting Hindu deities. The digitisation is part of a wider project at the university’s Bodleian library to make thousands of rare manuscripts and images accessible to the public. We commend #OxfordUniversity for digitizing 110 19th-century #KalighatPaintings of #Hindu deities & others & posting on new #OnlinePortal. Sir Monier Monier-Williams acquired the Kalighat paintings for the Indian Institute Library following his third fund-raising trip to India in 1883. You can trace the history of the Kalighat art to a Kali Temple on the bank of the Buri Ganga (a canal diverging from the Ganges River) in southern Kolkata (Calcutta). This form of Bengali folk art, created between 1800 and 1930, was a product sold to tourists and pilgrims as souvenirs. The sprawling metropolitan success of 18th-century Kolkata attracted a wealth of creative talents. Others moved to the city due to the economic grip of The East India Company in the region. Among them were the trained artists of Murshidabad and folk painters (patuas). A patua depicted mythologies, religious figures, popular proverbs, and contemporary events with vegetable and mineral dyes. These pictures were a patchwork of sequential images. Patua families travelled to rural villages to sing or recite these stories. Artists and craftsman found a living by selling inexpensive products at holy sites. Kalighat artists began to make smaller, single icon paintings, and Hindu deities proved popular. The cheap paper and quick brushstrokes soon turned the paintings into cheap commodities. This inexpensive product allowed more individuals to worship deities at home altars. In spite of the commodification, depictions reflected three characteristics (gunas): essence (satva), power and action (rajas), and chaotic power (tamas). Only a correct depiction meant a person could meditate in divinity. That sense of divinity relied upon the artist using correct colours. Saraswati, Goddess of learning is white, Lakshmi, the Goddess of Wealth is reddish gold. Whilst depictions of Kali, with her power to dissolve the cosmos, reflected dark tones. Yet, the inescapable impacts of colonialism meant some artists depicted goddesses in Victorian crowns, their poses reflected English nobility, and violins replaced the traditional veenas (a stringed instrument associated with Saraswati). In Hinduism, Kali embodies the female active principle of the faith, or power (shakti). Artists inverted the approaches of potential suitors into lapdogs or charlatans. Depicting women as Saraswati, goddesses of the arts, though westernised, reflected a broader social change: in 1849, the first female school opened under the banner of the Bethune College (and replacing an earlier Hindu female school), to be followed by a college in 1879. A desire for female education spread to other parts of India. The social reformer Durgaram Mehta (1809-1876), opened a school for girls in Surat in 1851. In Ahmedabad, a school for girls opened in 1849, under the banner of the Gujarat Vernacular Society, founded on Boxing Day, 1857 by Alexander Kinloch Forbes, a British administrator with the East India Company. The Gujarat Vernacular Society’s original aim of ‘civilising the natives’ evolved towards social change. Forbes’ society administered a school for girls founded by Harkor Shethani, the widow of businessman and philanthropist Hutheesingh Kesarisingh, and established an all women’s library. Others lampooned the hypocrisies of the upper-classes. To avoid libel, a cat painted with ritual stripes upon its forehead represented hypocritical holy men (sadhu). But the artists made sure to reflect the religious diversity of Kolkata; a small number of painting depicted the celebration of Muharram, an important month in the Islamic calendar. A further example included a painting of “Duldul Horse” on which Husain, a grandson of the Prophet Muhammad, was killed in the battle of Karbala. The number of Christian missionaries in Kolkata, including the Baptist William Carey (1761-1834) meant the occasional Kalighat paintings depicted Christian mythologies or iconographies. Towards the end of the 19th Century, Kalighat artists used their skills to highlight tales of scandal, including a high-profile murder in 1873. Today the rich traditions of this art form exist in Bengal villages. Essex based Muslim, (who is visibly Muslim), reported in what he believes is an anti-Muslim targeted hate crime. The individual had parked his vehicle at a seaside town and there were several cars that were also parked next to his. He came back to find that his vehicle had had its tyres slashed and there was no damage to other vehicles that were parked next to his. Obviously, the victim is distressed, angry and feels targeted because he is visibly a Muslim. We have previously worked with the Essex Police and Crime Commissioner’s office on the need to tackle anti-Muslim hatred and we will continue to do so. The post Car Tyres Slashed in Essex. Owner who is Visibly Muslim Believes Anti-Muslim in Nature appeared first on TELL MAMA.